The TurboMix™ is an attachment for the Vortex-Genie® 2 family of mixers that provides extremely vigorous mixing and vortexing of up to twelve 1.5ml or 2.0ml microtubes. The TurboMix provides a convenient hands-free operation while significantly increasing vortex efficiency in microtubes through a combination of vortexing and impact collision. Examples of applications for the TurboMix include the following: cell disruption of yeast, bacteria, plant and animal tissue when used in glass bead procedures. IMPORTANT! Read the following instructions before peeling off the mounting tape. The back surface of the Vortex-Genie 2 family of mixers should be thoroughly cleaned with isopropyl alcohol and dried completely. Carefully align the TurboMix mounting bracket (1) with the CENTER of the back panel of the Vortex-Genie 2 family of mixers ensuring that the locating tabs (A) are resting on top of the mixer. NOTE: If the mounting bracket is not precisely centered on the Vortex-Genie 2 family of mixers, performance will be compromised. Remove protective paper from the double-backed tape on the mounting bracket assembly and press firmly onto the Vortex-Genie 2 family of mixers. NOTE: The tape will instantly bond with the surface and cannot be moved. The TurboMix may be used immediately, however, the tape is not fully cured until after 24 hours. Once attached, the mounting bracket cannot be removed from the Vortex-Genie 2 family of mixers. To install the tube holder assembly (2), line up the key inside the mounting cup (B) with the flat on the stem of the mixer (C). Push down firmly to snap the tube holder assembly on the stem. 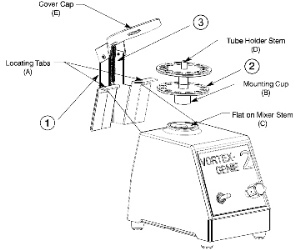 Ensure that the Vortex-Genie® 2 family of mixers is in the "OFF" position. A maximum of twelve microtubes can be loaded into the tube holder (tube volumes and quantities should be balanced within the tube holder). Make sure that the tubes are closed tightly. Close the TurboMix™ cover. The stem of the tube holder (D) should fit easily into the Cover Cap (E). Turn the mixer to "ON" and adjust to the desired speed. NOTE: High speeds are recommended for optimal performance, and the "TOUCH" setting is not recommended. To stop, turn the mixer to "OFF". Open the cover to remove the tubes. The plastic tube holder may be removed to allow use of the 3-inch Platform or Pop-off Cup by pulling straight up with a slight rocking motion. Avoid excessive bending of the components. DO NOT open the cover while the mixer is operating. DO NOT operate the mixer at highest speed continuously for more than three (3) hours with the TurboMix. Four unique rubber feet on the Vortex-Genie 2 family of mixers prevent movement of the mixer, especially when using the TurboMix attachment. The TurboMix consists of stainless steel and thermoplastic components. All pieces may be cleaned as needed with soap, detergents, bleach solutions and alcohol. The tube holder cannot be autoclaved.